From your heart to theirs, a heart pendent is a gift that really shows your love. 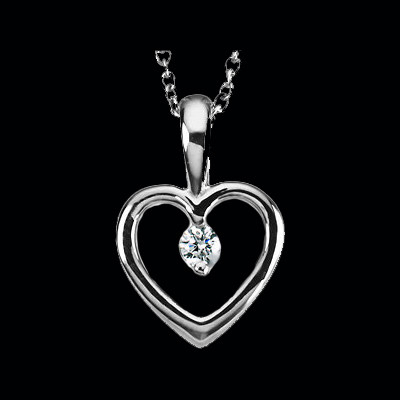 Anniversaries, birthdays, or simply to say, “I love you”, our stunning range of heart pendants will let you share your adoration with the person closest to you. Unique 14k Rose gold pink and white diamond heart necklace. 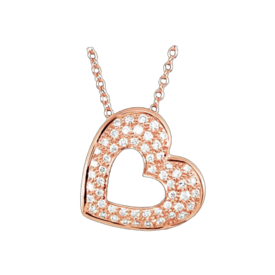 This pretty heart is set with 1/2ct tw pink and white diamonds and hangs from an 18 inch 14k rose gold chain. Delightful design you're sure to love. 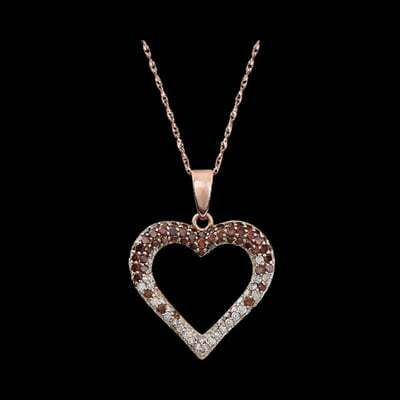 Stunning 14k White or Rose gold diamond heart necklace. This side hanging diamond heart design necklace is set with 1/5ctw diamond and 16-18 inches in length. A 16" chain with a 2 inch extension. Heart measures 15mm by 16.75m. Pretty loving necklace. 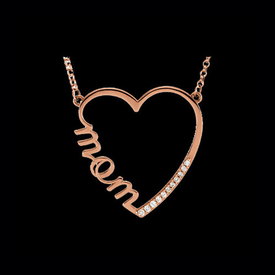 Loving 14k Gold "Mom" diamond accent heart necklace. This necklace is a beautiful sentimental gift. 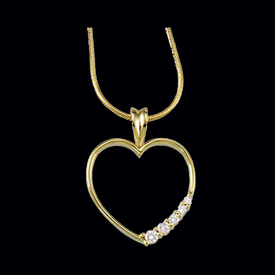 Heart measures 28mm x 28mm and this necklace is available in 14k Rose, White, or Yellow gold. Accent diamonds total 1/10 ctw. This necklace measures 16 inches in length. 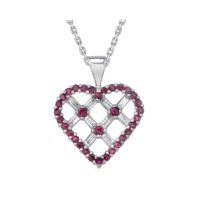 14k White gold Ruby and Diamond necklace. 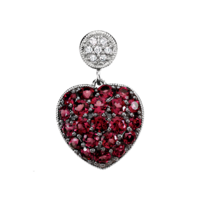 Round Ruby's total .60ct and are lovingly set in a heart border. 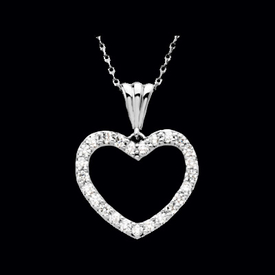 Inside the heart at baguette diamonds totaling .36ct. 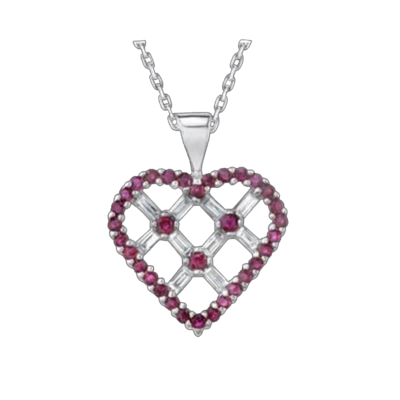 You'll love this unique Ruby diamond heart necklace. Beautiful Platinum diamond heart necklace. Diamonds total 1/5ct tw and the necklace measures 18 inches in length. A wonderful gift idea. 14k White Gold Diamond Key Necklace. 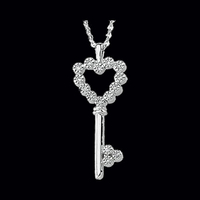 Great design, this Key holds 1/10ct tw diamonds and measures 1 inch in length. Lovely symbolic necklace. This diamond key makes a perfect gift, tell her she holds the key to your heart with this very affordable necklace. 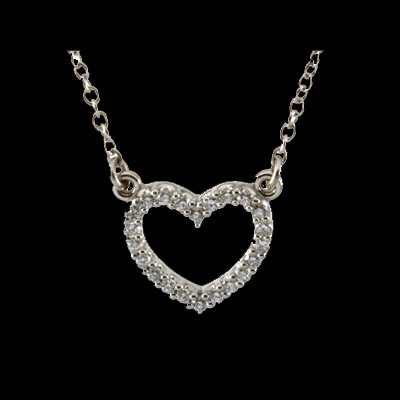 Platinum diamond heart necklace. 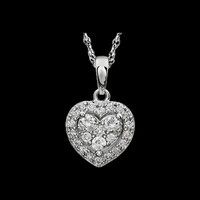 Diamonds total 1/8ct tw in this dainty heart. Diamonds are SI 1 clarity, G-H in color. Necklace measures 16 inches in length. 14k White gold Journey Diamond heart necklace. Graduated diamonds total 1/2ctw. 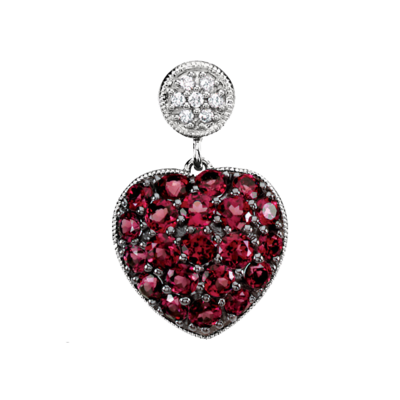 Journey diamond collection, with every step love grows. 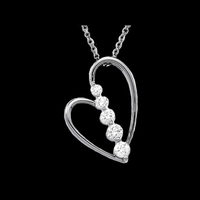 Let her know how much you love her without saying a word with this lovely journey diamond heart necklace. 14k White gold cable chain measures 18" in length. 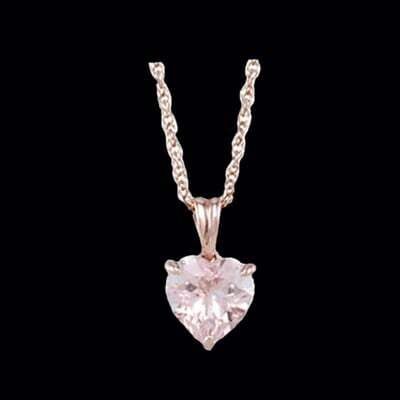 Morganite Rose Gold heart shaped necklace. Pretty 14k Rose gold set with an 8mm heart shape Morganite creates this romantic 18" long necklace. The soft pink color of Morganite is such a feminine design and always a favorite. A loving gift for the special woman in your life. Diamond side hanging necklace. Pretty 14k Yellow, 14k Rose, or 14k White gold side hanging diamond necklace. 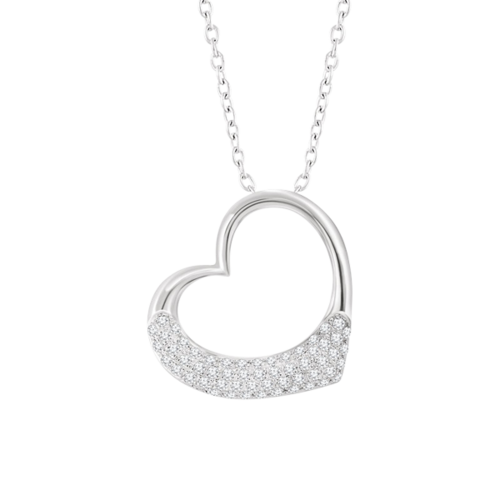 Diamonds total .27ct tw in this delightful necklace and the heart pendant hangs on a 14k gold 18" cable chain. A loving gift for the special woman in your life. Beautiful 14k Gold Diamond Heart Necklace. Journey Collection design necklace is available in 14k Yellow or White gold. Necklace measures 18 inches in length. 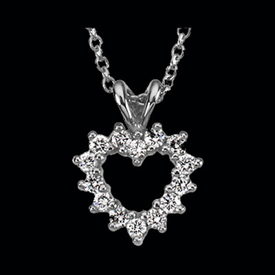 Diamonds total 1/5ctw and graduate to symbolize Loves Journey throughout time.